Beautiful weekend to you all and welcome! While outdoors thermometers dip well below -20C, I'm trying to warm up the environment with some sunny pictures. This pretty, purplish-pink wildflower is the Crown Vetch, member of the big Fabaceae family, like the alfalfa, clover, peas, beans, lupines, wisteria and many others. It is native to Asia, Europe and Africa but well known in many other parts of the world. For its deep, tenacious roots, Crown Vetch - Securigera varia, is used for erosion control, soil rehabilitation and roadside planting, being a showy groundcover, in the same time. It blooms from early summer to late fall, bearing small clusters of pink and white flowers on top of a fern-like foliage. Don't let the pretty flowers fool you, pool them out if you see them in your garden. 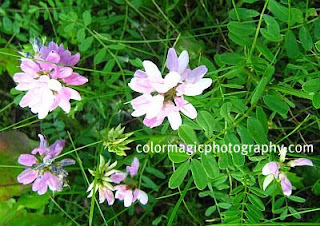 Crown Vetch is a very aggressive, spreading plant, even invasive in many places. However, it is suitable for a colorful groundcover on a sunny bank as long as you don't have horses on you property. This plant is toxic to horses, it can cause paralysis, or even death. These are really good! I love that color. you are minus 20, and I am at 20 and stupidly complaining it is cold. 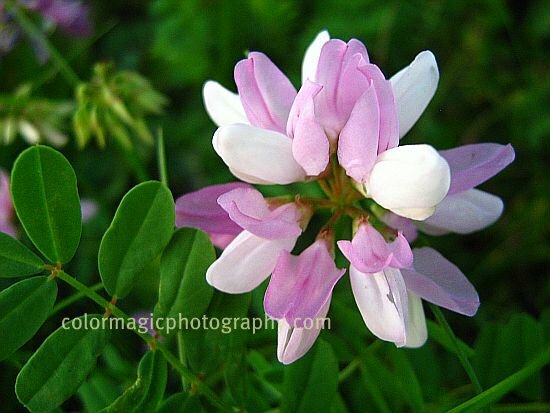 The Crown Vetch is so pretty, too bad it is so aggressive. I think I might like it in a planter or hanging basket. Wonderful purple tones in this little flowers... Great ! Beautiful flowers and great macro shot. Beautiful flowers! Thanks for hosting. Hope you're doing well Maia!